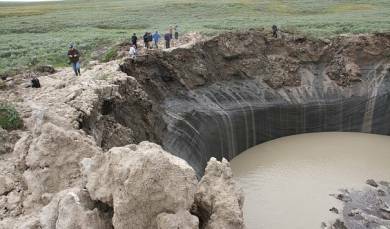 The scientists in the Yamalo-Nenets Autonomous District completed an expedition to the site of a giant crater in the area of ​​the Bovanenkovo ​​field. The press office of the governor YaNAO said that this expedition was the fourth in a row, it was organized for rapid research and documentation of recent changes funnel. 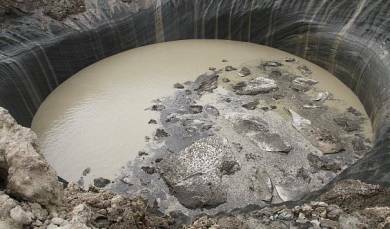 Found out that the funnel, as predicted, scientists began to fill with water: in winter and spring, it is filled with ten meters, this process continues. According to scientists, the majority of tundra lakes rounded shape on the Yamal Peninsula have the same origin as the Yamal funnel. Earlier it was reported that in the summer of 2014 near the Bovanenkovo ​​field was discovered a huge crater of unknown origin. Its diameter at the inner edge is about 40 meters on the outside - 60 meters, the depth is unknown. 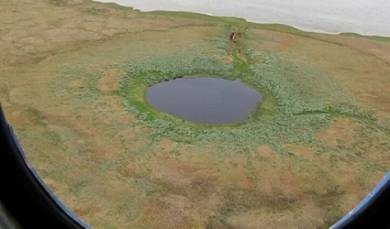 Deputy Director for Research of the Institute of Oil and Gas Problems, corresponding member of the Russian Academy of Sciences, doctor of technical sciences Vasiliy Epiphany notes that most of tundra lakes rounded shape on the Yamal Peninsula are thermogas origin as "Yamal funnel." The process takes place in areas where there paleomerzlota and underground ice.In connection with global warming in these areas are formed mounds of swelling. Vasily Epiphany: "These hills, reaching a diameter of up to two kilometers and a height of dozens of meters and look quite exotic in the tundra plains. Gradually these objects at high temperatures disintegrate and form craters. However, a year ago in connection with the formation of the Yamal funnel, we learned that they could still explode. "